The traditional view based on the Biblical account is that in the 10th century King David ruled over a United Monarchy consisting of Judea in the south and Israel in the north. By the 9th century it had split into two kingdoms, Israel that continued to exist until the Assyrian conquest in 722BCE and Judea that continued until the Babylonian destruction in 586BCE. In contrast the Minimalist school refuted the idea of a United Monarchy and saw David as a mythical figure. The kingdom of Israel established itself first, in the 9th century (low chronology) and a monarchy developed in Judea only after the destruction of the kingdom of Israel in the late 8th century. With the discovery of the House of David stele at Dan the Minimalists had to grudgingly concede that David could exist but was a minor chieftain who ruled over a limited area, not an extensive kingdom ruled from a centralized location. 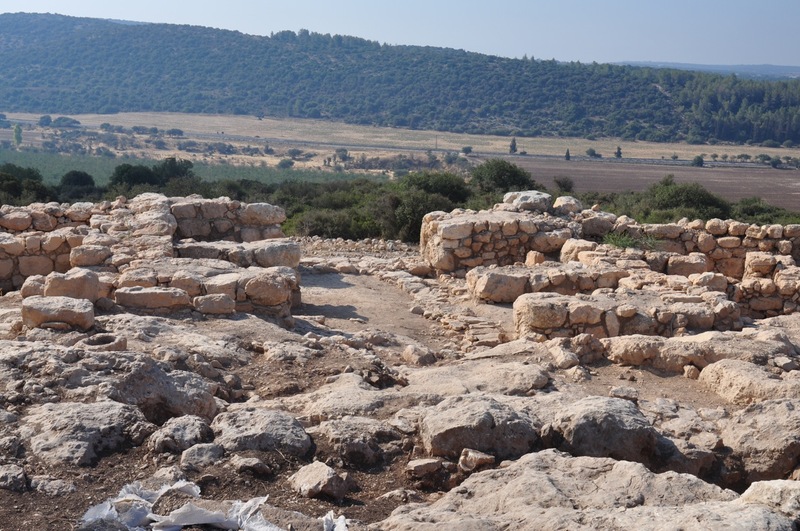 With the discoveries at Khirbet Qeiyafa, a site in the Elah valley Prof. Yosef Garfinkel of Hebrew University is convinced that he has uncovered a Judean town that is dated to the 10th C. To build fortifications like those at Khirbet Qeiyafa, requiring moving 200,000 tons of stone, could not have been a local initiative but would have required a centralized government. The site is small, 23 dunam enclosed with a casement wall situated on a hill overlooking the Elah valley with human occupation for about 20 years. 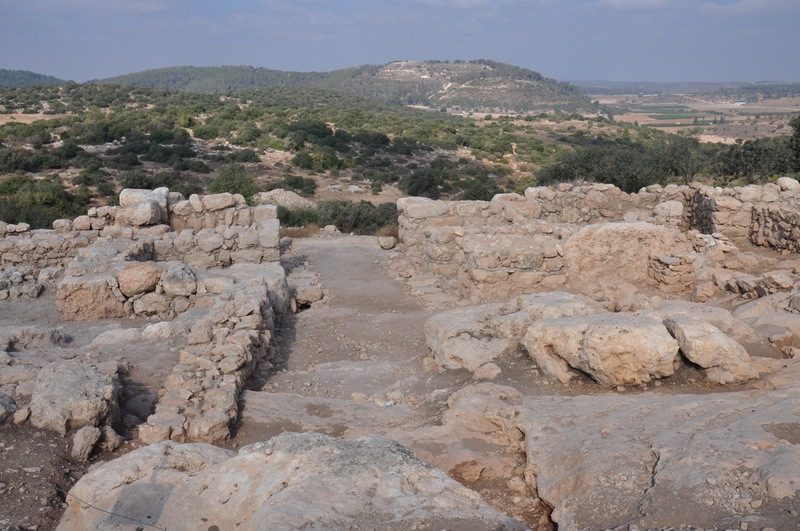 Garfinkel suggests that the site was destroyed by Phillistine Gath/Tel Safi a larger town only 12 km to the west (Prof. Aren Maier who heads the excavations at Safi concurs); the Bible describes numerous border disputes in the Elah Valley region during the 11th-10th century BCE. There are only 3 building strata layers: 1) the late Roman/Byzantine period, 4th to 6th century when it included a fortress or caravansery at the center of the site, 2) late Persian or early Hellenstic period (ca. 350-270BCE) and 3) the lowest stratum directly on the bedrock dated to Iron Age IIA, existing in the late 11th to early 10th century. The dating is based on pottery and artifacts correlated with the results of radiometric (Carbon 14) dating of 4 burnt olive pits that yield a calibrated date of 1051 to 969BCE with 77.8% probablity which supports the ‘high chronology” of the biblical traditionalists. Features and artifacts unearthed at the site suggest that it was a Judean settlement. The structural style of the casemate walls was classically Judean, matching similar construction at the ancient excavated sites of Beersheva, Tell en-Nasbeh, and Tell Beit Mirsim. Thousands of animal bones were found (goats, sheep and cattle) but no pig bones, found commonly at nearby Phillistine sites like Ekron and Gath/Tell Safi. Pottery found is different than that at nearby Gath. Fragments of an almost complete pottery baking tray hinted at a culture that was unlike that of the nearby Phillistine sites. Khirbet Qeiyafa is the only archaeological site discovered in Israel so far that has two gates. Garfinkel says, “Even cities three or four times its size, such as Lachish and Megiddo, have only a single gate.” Based on location, dating and the two gates Garfinkel identifies it as Shaarayim (Hebrew for two gates) mentioned 3 times in the Bible. In the city list of the tribe of Judah it appears after Socoh and Azekah (Josh 15:36). Socoh is located 2.5 km to the southeast of Khirbet Qeiyafa and Azekah 2 km to the west. After David killed Goliath the Philistines escaped through the “road of Sha’arayim” (1 Sam 17:52). In the city list of the tribe of Simeon, Sha’arayim is mentioned as one of the cities “until the reign of David” (1 Ch 4:31–32). It’s exciting to have the opportunity to attend an annual archaeology conference reporting on the latest research about Israel 3000 years ago. But more than that it’s possible to visit and explore the actual sites. After hearing Garfinkel’s interpretations I drove to the site to see for myself (I do guided tours of Khirbet Qeiyafa). Notice the drainage channel in the Southern gate (and our golden retriever, Sumsum, who likes to go on tours). the remains of what is called the Large Stone Structure are not one building. Similarly, the Stepped Structure is not monolitic but contains segments from Iron age IIA and Hellenistic periods. There is no connection today between some of the Iron Age IIA components of the Large Stone Structure and the Stepped Structure. The only physical connection is between the walls and the top section of the Stepped Structure which is from the Hellenistic period. Some of the massive walls may be from Iron Age IIA, (he uses low chronology, 9th century) but others are from the Hellenistic period. 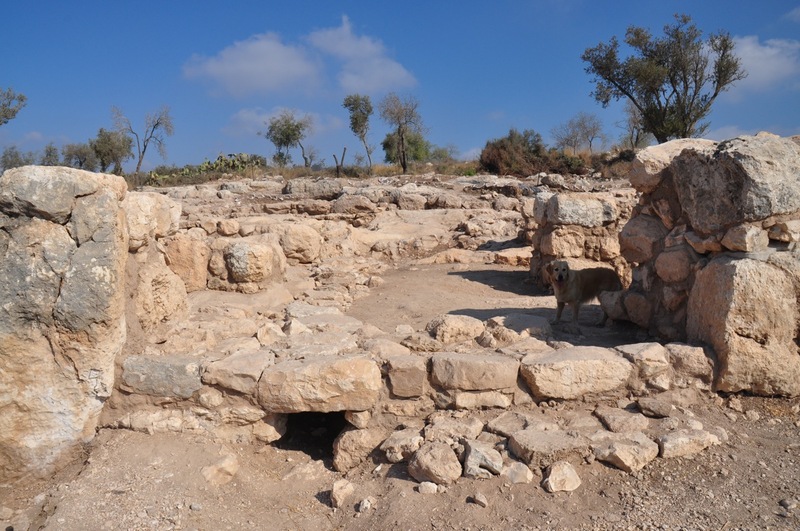 Finkelstein concludes that no experienced archaeologist would claim to have uncovered a monumental building from the 10C BCE based on the archaeological evidence. This entry was posted in Archaeology and tagged casement wall, Israel, Judea, King David, kingdom, postaweek2011 on September 20, 2011 by Shmuel Browns. Finkelstein, in his article on Shiloh in BAR in 1982, also said that Shiloh is not mentioned at all in the Patriarchal narratives. Apparently he didn’t read the end of Genesis, where 49:10 states:”Until the coming of Shiloh”. The fact that the BAR editors didn’t pick up on this blatant ignorance does not speak well for their biblical understanding either. Taking Finkelstein’s biblical opinions with any more than a grain of salt is a very risky proposition indeed. Finkelstein always uses the comment “no experienced archaeoligist would agree with this” to refute another archaeologist! Why cant he use the strength of his own argument rather than calling on the backing of all other archaeologists of whom he hasn’t requested support? Thanks for your comment. No question that Finkelstein is a character. I guess you could call him a doubting Thomas, until the archaeological evidence matches the theory he won’t agree. In the case of Mazar’s excavation in City of David he has some strong arguments. Against Garfinkel he has a good point – even if Khirbet Qeiyafa is a 10th C Judean town with 2 gates and is Shaarayim it doesn’t prove that King David ruled over an extended area from a centralized location. Come visit Israel and see for yourself. Supporting “evidence” is a slippery thing, on any side of an argument. This applies to Finkelstein as well as Garfinkel. Archaeological finds are subject to interpretation, a human function that makes true objectivity somewhat elusive. Both Finkelstein and Garfinkel have an interest in protecting their own professional and scholarly images, and this may color their respective analyses to some degree. Nobody wants to be “wrong”. It may not say anything about someone named David but it does point very strongly to the existence of a central government in Yehuda which has the wherewithal to build this fortress/town and also has an interest in a military presence at its periphery, facing the Plilistine threat at Gat etc.. And if it can build at the periphery, that would suggest that there is something more substantial behind it, i.e. in Jerusalem.